Note ambiguity about classification at the section Systematics. Mustelids are a family of carnivorous mammals. They are the family Mustelidae, in the order Carnivora. They are the largest family of mammals. They are diverse, from weasels who eat mice to wolverines that can kill prey much larger than themselves. 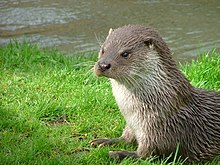 Mustelids live in many habitats: otters for example, live mostly in the water, while one species of weasel lives in the Arctic. One kind of mustelid, the ferret, has been tamed and used for hunting for a long time. These days it is mostly kept as a pet. Because the ferret looks a bit like a rat that has been stretched out in the middle, it is sometimes called a tube rat. These are other well-known animals from the mustelid family. Wikispecies has information on: Mustelidae. Wikimedia Commons has media related to Mustelidae. This page was last changed on 21 November 2017, at 11:59.